Peter fed the lost sheep of the world. The Spirit touched the hearts of three thousand through him and they were touched and came to the Lord. Other men walk the fields of this world feeding sheep. God places urgings on man’s heart and opens doors to be walked through. The following is a small account of recent journey to Pakistan that was made from a Pastor friend of mine. He went out into the world, as he does regularly, with the intent of not only feeding God’s people, but teaching them how to effectively become fishers of men themselves. Teach the teachers. Please join me in my constant pleasure to pray to God for this man and many like him. God bless men of God who dedicate their lives to this level of obedience. Surely God smiles upon them. My flight was much better than I expected after my first 4 hour jammed flight to Chicago. For the long leg 13+ hours to Dubai, I found myself sitting in the back of the plane in an empty row of chairs. This is rare these days for those who don’t fly much. Planes are always packed, but I found myself stretching out and sleeping for several hours! Then in the short leg from Dubai to Pakistan, 3 hours, I was moved from economy to business class, where my seat turns into a bed. This flight was too short! I enjoyed the food and service. Because I was in business class I was the first one off the plane and through customs quickly. When the baggage came out, mine was the second bag on the conveyor belt! That never happens! Mine is usually the 300th one off. It’s Sunday and as I arrived at the church I was speaking, children were lined up on both sides of the sidewalk that led into the church. I was showered with flower peddles as I walked through the kids. Then as the service began, they presented me with a beautiful lei. I spoke to a fairly large church. It went well and the people seemed to enjoy the Word. After the service we went to visit several homes. We prayed for each of the families. One of them was dying from cancer. We prayed for his healing after anointing him. He was a believer so his life is in good hands! After the home hopping, we traveled into the city center where there is one of the largest mosques in the world. The signs said we were on holy ground but I sure didn’t feel the presence of God. Going home we got caught in a traffic jam that took us several hours to maneuver through. The driving in these cities is crazy. Everyone seems to have their own rules. The Internet comes and goes with electricity so I’ve had little time to get out a message. I spoke at two outreaches here. There has been lots of rain so the crowds have been small but have enjoyed sharing the Word. Thank God His Word never returns void! It was interesting to watch the people as they sat on the floor (only a few chairs). The women sit on one side and the men on the other. The kids sit down front and when one acts up an elder in the church walks up and gives them a shaking and moves them to an adult. Most of the kids listen attentively. (I think I would to with that elder back there!) My host pastor has a six year old and when asked what I was teaching, he said about a King Jesus who is very powerful! I was speaking out of Mark 1 that the King has come with great authority. The worship is so different from the West, but as the church was singing last night from Psalm 19 you could sense their deep love for Him. Heaven will be so wonderful as we will all be able to speak and sing the same language. The conference is going very well. 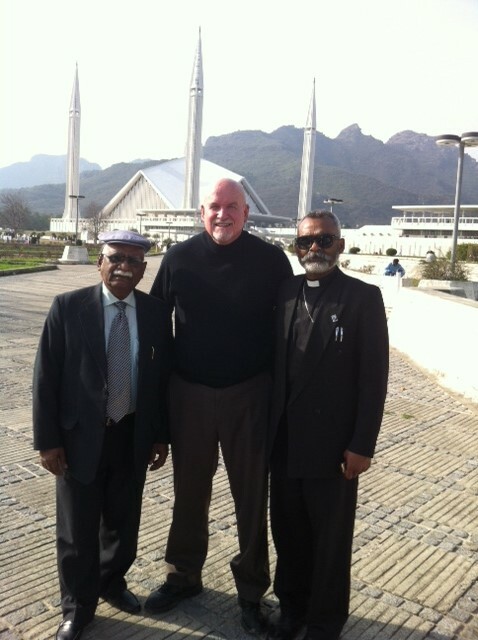 We have pastors from many places of Pakistan. Some traveled over 30 hours to be here by bus. They tell me this is such a different way to study that they have never been exposed to before, but they really like it and see the value. This is a very sharp group that is well educated and are catching on quickly. 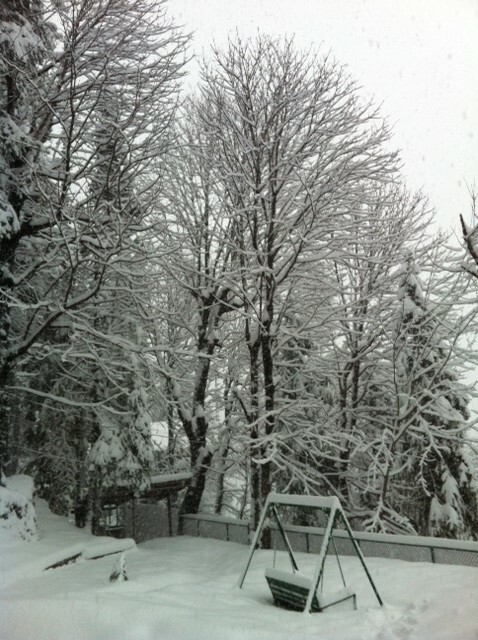 Its very cold with lots of snow. None of the buildings are insulated, so gas heaters help but not a lot. No one complains of the cold or long days. We have just finished a very long day but incredibly productive. Today we covered Jude and how to prepare small group studies from Mark 6. They loved both studies and clapped loudly and cheered at the end of both. In the evening I continued my exposition of Philippians. Greetings! 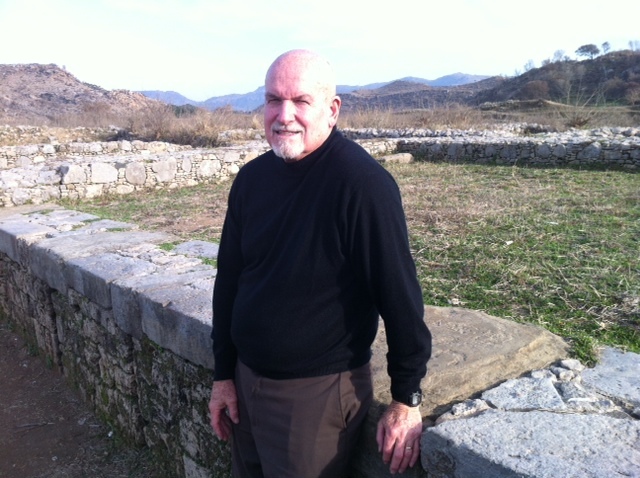 I have returned safely home after two weeks in Pakistan. I am sorry my last updates were not sent out. We had poor connections while in country mainly due to constant electricity failures. I was told that the entire country was blacked out multiple times a day. My time with the pastors went very well. We finished up our seminar late Friday afternoon with the pastors preaching from Isaiah 1. For many of them this was the first time they ever preached verse by verse. They loved learning many new ideas for our time together. There was a great excitement in the air as we concluded with graduation. 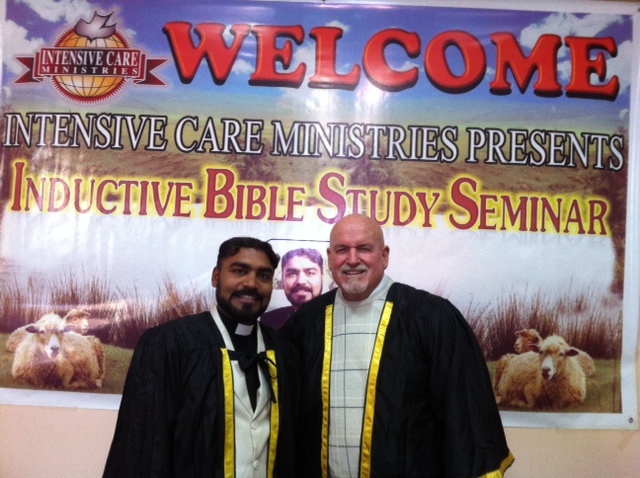 Things are done very formally here and graduation included gowns as you can see in my picture with Pastor Zeeshan. Our ceremony started from the dinning hall and we had to walk outside down long flights of steps to the main chapel. Because of much snow, the steps were very icy and it was an interesting walk down, often slipping, but I made it! 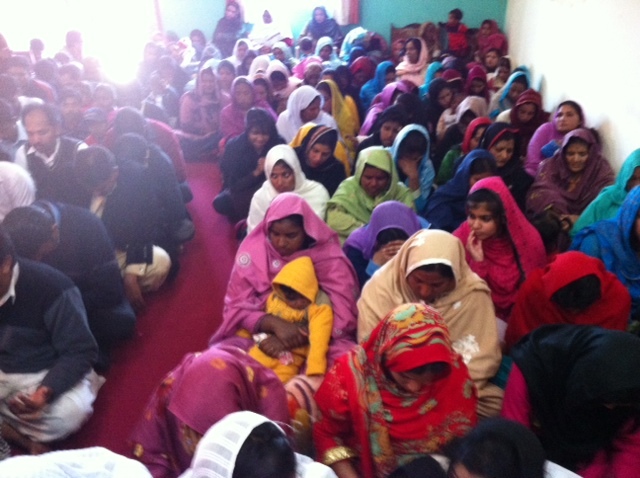 The pastors left committing to taking the IBS all over Pakistan. God did an awesome work all week long and your prayers were answered! Mission accomplished! May not be reproduced, all or in part, without permission. It was a blessed and heart moving, great time with Pastor Dan. Its honor for me to teach the IBS system in Pakistan.